Editor's note: This feature is part of a series focused on offsite construction. To view other articles in the series, check out the spotlight page. The construction industry has found itself at a crossroads. While the industry has been resistant to change, the built world around it has not been — and the need for additional housing, offices, schools, hospitals and more in shorter timeframes is only growing. As product manufacturers of all kinds have retooled with replicability and expediency in mind, construction companies are taking note of their success. What they've learned is taking shape in offsite construction, a method that is gaining steam in the U.S. Here, the industry is grappling with a widening gap in its skilled-labor channel and a need to complete project schedules quickly and with fewer resources. A 2014 report from the National Institute of Building Sciences found that 93% of respondents in the AEC industries had used offsite methods to some degree over the past year. Of that share, respondents said the main benefit of offsite was its ability to reduce project timelines and its cost effectiveness. Those kinds of paybacks are expected to drive use of the method going forward. The following five trends show where offsite building techniques are today, and where they’re headed. Today’s construction activity is at 2007 levels, but with 100,000 fewer skilled workers on the books. General contractors and developers are facing challenges filling their worker pipelines and, in turn, keeping up with tight schedules and even tighter budgets that make it increasingly difficult to maintain their margins. “It is much more efficient for an owner, developing properties in multiple regions, to contract with one or two modular factories rather than trying to find workers in several labor markets — and likely at differing rates,” said Tom Hardiman, executive director at the Modular Building Institute. 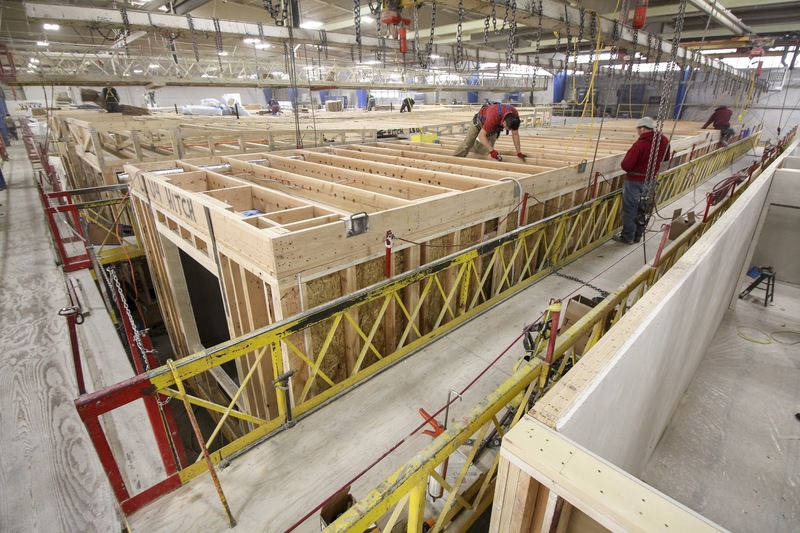 Construction workers fabricate a building component in Guerdon's modular building factory, in Boise, ID. Lad Dawson, founder and director of Guerdon Modular Buildings, in Boise, ID, said offsite construction can take up to 40 to 60% of labor off the job site, opening up cost and time-saving opportunities for contractors and developers looking to speed up their project schedules. Workers watch as a Guerdon modular unit is delivered to the job site. Offsite construction teams are working together through BIM to ensure the process starts as early and as seamlessly as possible. Roger Krulak, CEO of Brooklyn, NY–based FullStack Modular, said his company’s entire design–build process is run off of an electronic enterprise resource planning (ERP) system built from 3-D BIM models. “The reason that collaboration didn’t happen a long time ago is that the ability and desire for businesses to do that hasn’t until recently gotten attention,” he said. “Costs are rising and quality of labor is disappearing." Whether to address housing needs or tight project schedules, more major companies will take up offsite. Google has plans for 300 modular apartment units in San Francisco’s squeezed housing market from nearby modular-home fabricator Factory OS to provide short-term housing for its workers. Meanwhile, according to Hardiman, retail chains like Taco Bell and McDonald’s have turned to offsite techniques to open new stores more quickly. 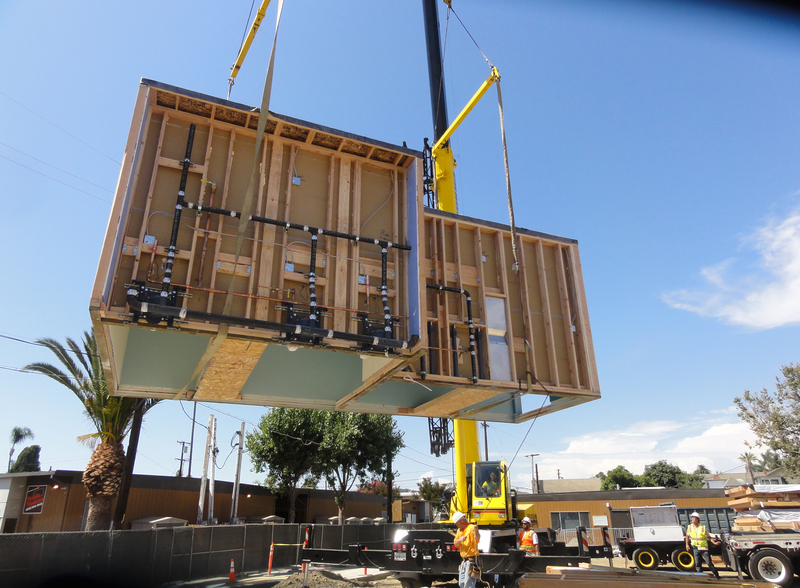 Project Frog delivers an offsite-built bathroom pod to a California job site. Marriott International is also upping the ante in its use of offsite. 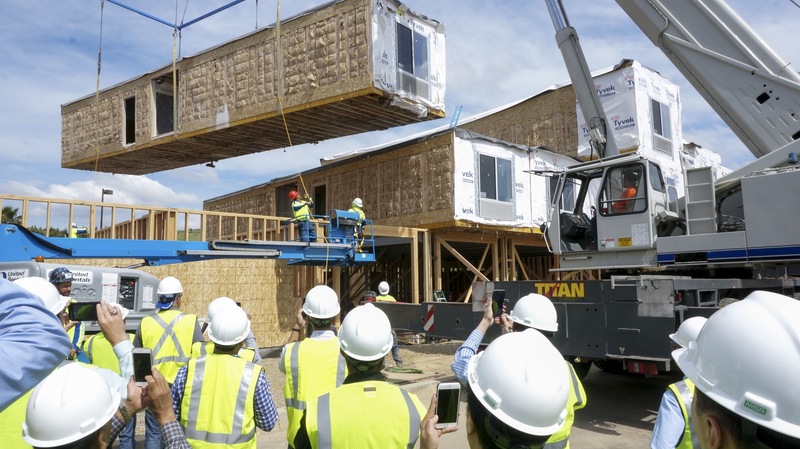 The company announced plans to use modular on around 13% of its new North American hotel projects this year, with expectations of signing 50 deals that would include prefabricated bathrooms or guest rooms in their designs. The company has said it wants to increase offsite development to reduce building costs and offset challenges associated with labor shortages for its franchisees. So far, Marriott has opened one such hotel in California — a project that was finished two months ahead of schedule — and it has four more in the pipeline. “Even though this process has been around for decades, it feels as if some of these large companies are early adopters,” Hardiman said. That's pushing use of the construction method to a tipping point. “One thing that will help greater adoption [in the U.S.] is that many of these large corporations have been building this way in other parts of the world for a decade or more," he said. For years, many construction companies were less receptive to offsite construction due to its association with having to trade style for functionality. Recently, however, more general contractors and owners are learning that offsite methods can afford the benefits of speedier construction work without restricting innovation in design. Marriott’s success with offsite construction is one of the drivers of that trend. The hotel chain only recently strengthened its efforts around offsite, namely with its pilot modular initiative. However, its ability to maintain its branded style across its conventionally built hotels and those built using offsite is showing industry leaders that the construction technique can be executed within existing businesses. Dawson said interest in Guerdon’s services has seen a sharp increase over the last three years as awareness of offsite construction methods’ capabilities has spread. Education among the industry, he said, is key to understanding offsite and how it could benefit construction. Dawson said he is seeing negative perceptions surrounding the construction method diminish as the result of his company’s investment in educating architects, developers and general contractors. The education process references successful project completions and includes factory visits for developers and general contractors to get a better sense of what the process entails. That’s led Guerdon to grow its stake in the modular building segment across the western U.S.
“The key to improving perception is having more successful projects and promoting them across the industry,” Dawson said.